Searson has toured throughout Canada, the United States, Germany, Denmark, Portugal, Switzerland and the Caribbean for well over a decade and have the confidence and drive to continue with their musical careers more than ever before. Sisters, Erin and Colleen Searson, have developed their own original style of high energy fiddling, passionate vocals and step dancing. 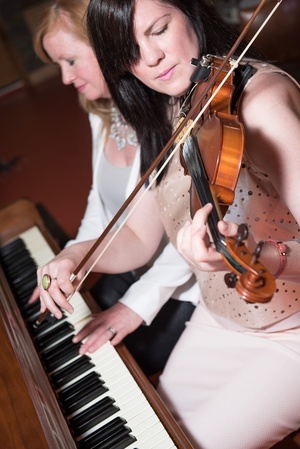 The sisters perform on a variety of instruments throughout their live show which includes Colleen on fiddle, vocals and Ottawa Valley Step Dancing while Erin performs on piano, vocals, Ottawa Valley Step Dancing and tenor guitar. Searson appeared on an episode of ‘Still Standing’ on CBC featuring the history and culture of The Ottawa Valley Fiddling & Step Dancing. In the episode, the host Johnny Harris (Murdoch Mysteries) speaks with Searson about their new release ‘Stars Above The Farm’ and showcases Searson’s raw talent. Growing up in the Ottawa Valley, Ontario, Canada these sisters began to study music when very young, performing locally and competing at Step Dance & Fiddle Contests. Since the age of 4, Erin has been classically trained through the Royal Conservatory of music in piano. Colleen has been studying violin and fiddle methods from all styles around the world since age 9 while both began step dance lessons before the age of 9. This prepared the sisters to grow and expand as they became accomplished performers and musicians and increasingly began to tour across borders and overseas. A love of incorporating the Ottawa Valley style music with Celtic, East Coast, Scottish and various other styles can be heard throughout the live show.